This is an ongoing project of coordination and communication activities for the joint venture. In response to threats posed by the overabundance of the greater snow goose (GSG) population to Arctic breeding habitats, a liberalization of hunting regulations and a spring conservation harvest in southern Quebec were implemented 1999 to control the population. A scientific program was set up in 1998 to monitor the impact of these actions on GSG demographic parameters (hunting mortality, survival, fecundity, and population size) and its Arctic breeding habitat. This proposal address three information needs identified as high and medium priorities for GSG by the AGJV: (1) population dynamics/harvest assessment, (2) population assessment, and (3) habitat concerns. The purpose is to obtain updated information on population dynamics/harvest assessment by continuing the annual banding and nesting monitoring programs on Bylot Island, two activities considered a high priority by the AGJV and recommended to be maintained by the Avian Monitoring Review Committee (2012) of Environment and Climate Change Canada. This will provide information to evaluate the specific effects of management on demographic parameters in recent years. The Hudson Bay Project (HBP) maintains a 46 year tradition of long-term research on lesser snow geese and their interaction with and impact on the coastal and near-coastal ecosystems of the Hudson Bay Lowlands. The HBP demonstration that the increasing snow goose population’s destructive foraging was causing unprecedented damage to these ecosystems was a primary finding that ultimately led to attempts to reduce their abundance. The HBP research program continues to provide data needed for revision of the light goose management plan as well as insights on the ecological processes underlying habitat degradation and on methods to mitigate that damage. 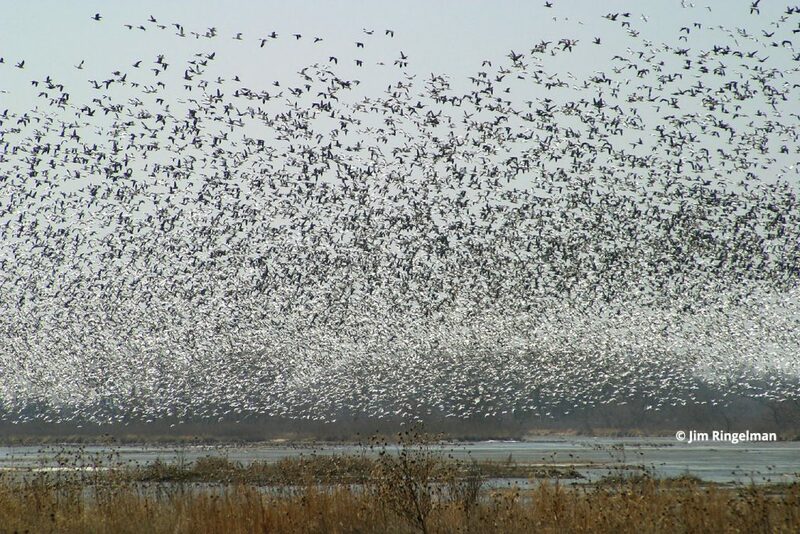 Very high populations of light geese, particularly midcontinent lesser snow geese, have led to concern about large-scale change of arctic ecosystems (Ankney 1996, Batt 1997), and their effects on other species. To fully understand response of Ross’s Geese and midcontinent snow goose populations to increased harvest, survival, recruitment, and population growth rate should be measured. Work at Karrak lake provides an important and independent annual estimate of population growth rate uniquely unavailable from other colonies, and contributes to the marking of a sample of geese representative of Ross’s geese in North America, and midcontinent lesser snow geese that nest in Arctic Canada. The Arctic Goose Banding Program is one of the primary means of monitoring the statue of Arctic-nesting geese, and involves representative banding of lesser snow geese, Ross’s geese, greater white-fronted geese, cackling geese, and Atlantic brant at several concentration areas in the Canadian Arctic. Long term banding of Arctic geese takes advantage of information provided by hundreds of thousands of North American waterfowl hunters who report band numbers from marked birds that they harvest, providing detailed information not only about population dynamics and distribution of these species, but also factors that influence those patterns. When used in combination with harvest survey data, band recoveries can be used to estimate population size, and this technique may be more reliable and more accurate than existing indices for such large, remote, and geographically widespread populations. Little is known about the status and sustainability of habitats in the areas that sustain the vast majority (nearly 80%) of breeding snow geese in the eastern Arctic (Baffin Island, Southampton Island). Obtaining a more comprehensive knowledge of the geographic distribution of impacts associated with overabundant snow geese through the northern migration and breeding areas is considered a high priority for the AGJV. This project targets this critical information gap. Population dynamics of western Arctic snow geese and the effects of snow geese on sympatric goose species are high priorities for the AGJV. At its current rate of increase, the population of lesser snow geese on the Arctic Coastal Plain (ACP) of northern Alaska may double every 3-4 years. The black brant population on the ACP is also increasing, although more slowly than that of snow geese. Snow geese and black brant share nesting islands and brood-rearing habitats on the Colville River Delta and elsewhere on the CP. Harvest rates of marked birds from this study will inform management decisions for the western Arctic population of snow geese. 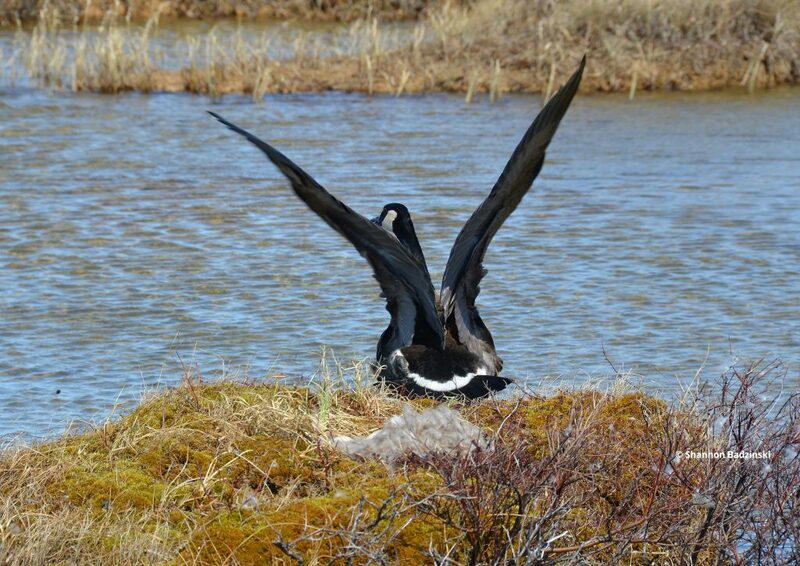 Continued banding will aid in predictions of whether the snow goose population is apt to continue to increase more quickly than that of black brant, and whether brant are at risk of being displaced from nesting areas and put at a competitive disadvantage on brood-reading areas.